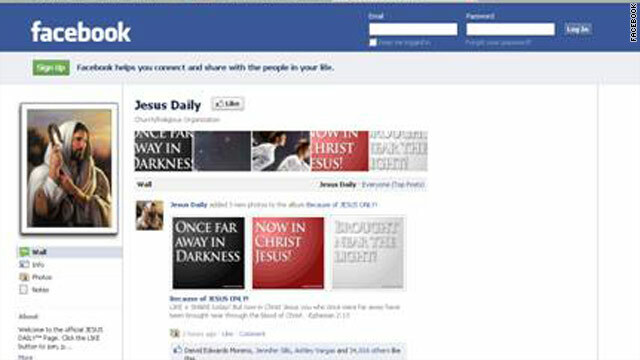 The Facebook page for Daily Jesus has 8.4 million "Likes." Take a guess: What Facebook page has a more highly engaged audience than any other? Justin Bieber’s? Kim Kardashian’s? Manchester United football club's? No, it’s Jesus Daily, a page that had 8.4 million “Likes” and belongs to a North Carolina-based diet doctor. The New York Times reports on the page, which Dr. Aaron Tabor began as a hobby in 2009 after he began using Facebook to promote a diet book he wrote and a Web-based diet business, which includes selling shakes and protein bars. The page features a picture of Jesus dressed as a shepherd and is updated daily with biblical quotes, prayers and reflections on the man who Christians call the savior. When I despair.......HE GIVE ME HOPE. When I am sad.......HE BRIGHTENS ME. When I stumble.......HE STABILIZES ME. What is new is that millions of people are also turning to Facebook pages, like the Jesus Daily, created by people unaffiliated with a religious leader or a specific house of worship. With 8.2 million fans, the Jesus Daily counted 3.4 million interactions last week, compared with about 630,000 interactions among Justin Bieber’s 35 million fans, the AllFacebook.com analysis shows. The Bible Facebook page, run by the United Bible Societies in Reading, England, has eight million fans and also beat Mr. Bieber with about a million interactions. Amid pages for Lady Gaga, Texas Hold’em Poker and Manchester United, Joyce Meyer Ministries is in the top 20, along with another page devoted to Jesus Christ, and the Spanish-language page Dios Es Bueno, or God Is Great. I want it to be about encouragement. There are so many people battling cancer, fighting to keep their marriages together, struggling to restore relationships with their children. There are people out of work, at the end of the line and I just want the Jesus Daily to be a central place where they find encouragement, no matter what battle they are fighting. Posted on 16 Teams by BCS (Which is how UGA gets in). Homefield to the highest seed so there's less wiihnnng about travel and more money to higher seeds who get home games. 8 Bowl games = First Round so teams still get money from a bowl win (that leaves 26 of the we can't forego tradition bowls like the San Diego County Credit Union Poinsetta Bowl, or the Champs Sports Bowl, or the very traditional Gaylor Hotels Music City Bowl, etc. etc.) If they say they can't fit it into the season, get rid of the pre-season or just cut all but the first warm up game out. Sorry, no more padding with I-AA teams or the Pac-10. (Don't get rid of rivalry week though). Sure, there might be some repeat games (Texas v. OSU, Ala. v. UGA) but who wouldn't want to see them fight again? People who are scared, that's who. This way, there'd only be a few extra games, and the season would still end before the second semester starts (which is why the season is what it is, NCAA rules say only one season per semester, except the BCS Naty Champ which is much $$$ the real pusher in NCAA sports). Dang He Get Facebook Friends? I tried to find holes in all the atheist statements here.. I really did.. and except "you don't know Him. You never felt his love and so you blaspheme", I could not come up with any way to counter your arguments..
Oh, I came up with one more.. "You can not understand His love, because god only reveals to the faithful. you need to have belief to get the proof of his existence". But I realize, if you can believe that 1=2, only then can 2 be equal to 3. You are saying their presumptions are false, but they have none. They have one belief. You do not know for a fact that your presumptions are true or false. You have "faith", which is belief and nothing more. As a former christian? I would honestly say that people who write things as you do in answer to athiests may have belief issues yourself. To me, those who truly believe do not feel the need to insult those who do not. That shows an insecurity in your own beliefs. I love the way they make me laugh with their way out ideas. I find the idea that an explosion created the universe rather then destroying it. And monkeys magically turning into humans over time? Atheists are such a riot! Clay, you do realize that explosions are not always destructive.. Try to find out about about how your car moves forward which involves series of controlled explosions in closed places.. you can read about it on the net.. unless your religion disallows it..
Posted on Having just spent a year taking care of my slwoly dying father, seeing Hereafter really affected me, because it deals with the connection of the dead and dying to the living. Like the french journalist in the film, I discovered that no one wants to acknowledge the altered state in which you find yourself after you have been intimate with dying (not quite the same as being intimate with death). Remember in one of the Harry Potter books that the children always arrive at Hogwarts pulled by horseless carriagesor so Harry thinks? After he experiences first hand the death of a friend, he can see that the carriages are in fact pulled by beautiful black horses, and realizes that only people that have seen death first hand can see the horses. (I think its black horsesit might be black dragons). Anyway, the point is that I felt very grateful to Clint for addressing this hugely significant aspect of livingknowing dyingAND addressing the fact that our culture wants to keep the experience as sterile as possible. Made me go on a mini Clint Eastwood jag, re-watching Gran Torrino and everything except the Dirty Harrys (yuck). "I have 4 pair of clothing, one pair of shoes, a back pack and toiletries and nothing more. I live day by day, I go where I am needed. On occasion, my family pays for me to come home where I get a warm bath and amenities. Unfortunately, it's a hard life one many can't do, which is why christians will never be like their christ. If you have ever tried to do without, been without, known what true hunger feels like then even if you claim to know you don't." By your statement I could safely presume that you too don't have much in life, yet, you were saying that you "give everything". However, as what Jesus said in the Gospel of Luke 21:2-4 "you had casted more than they all"
But the problem here is, apparently you don't believe in God and to that Gospel either. Hence, you willfully deny the chance of a divine reward from your noble acts. Practically, there's a huge possibility for you to become the problem rather than the solution. You don't need to give everything you have, all you need is to give time helping them silently and humbly rather than spending much of your time presumptuously propagating your "goodness with no God required" on this board. Religion is only for the weak, and they prey on the poor too. I know what its like to be really poor too, when there's just zero food, and zero money, thankfully I always try to get through strong and NEVER turn to some make believe manmade fear patheticness such as religion. If anyone out there is down and out, yes try to get help from parents or others that give, but NEVER presume that the church is your savior, they are one of (if not the most) richest wealthiest group in the world, and they always prey on the weak as this poor soul above has knelt to. It's a shame. GOOD NEWS: JESUS IS RISEN. HE IS RESURRECTED. Chris iantiy is the worship of Homicide. The cross is the electric chair of its day. Mary got r aped by a soldier, possibly "dark". It is a child m olesting machine the Christians. Jesus could not possibly be caucasian...if he returned today they would think Him a Terrorist and send Him to Gitmo. All children laugh at heck and think heaven is boring. All your children are now Jewish. Your reign of terror is over. Remember that Father God is supernatural, as his Son Jesus, and the Holy Spirit is. The physical world will bot be able to explain anything about it, it will not make sense. Science can not prove the supernatural because it is supernatural. 1. There is one God, we do not know its nature. 2. There is an afterlife but we do not its nature. THAT is why everyone hates Jews. No Santa Claus. There is no proof for the supernatural. That is why there are atheists. We like real things. Jesus saves mankind. Satan and atheists are jealous. it would be nice if adukts on this page could post what they have to say and leave it at that. Instead, must be so nasty to others for no reason, other then they do not like what they post. As a child, I though that adult were always more mature..boy, what a let down!! Betcha, I find it hysterically ironic that you post that after one of Carla's posts. She is one of the most offensive, hateful posters here. I am sorry you feel the way you do. Are you hungry? Do you need food? I see you continue mentioning people who are dying from starvation. Tell me, what have you sacrificed so that others may eat? Everything how about you Jeremy? I have probably done more in one week than anything you have done in your life. Keep making excuses for your poor behavior and logic. @Christine "Everything." What does that mean exactly? Literally everything would imply that you are dead (you gave your life), and you donated your body to help others and gave away all your possesions as well. Since you have enough life, and a computer by which to comment, what did you mean by "everything"? And to answer your question, you should consider the Salvation Army and missionaries who give their whole lives to helping those in need because God calls them to (unless you don't believe in God, in which case the point about debating what "God has done" is useless, since you don't believe in Him!). I've done much for helping the poor and downtrodden (I would never be so bold to say that it's "my share" or "enough" because there is simply so much need in the world and not enough hands meeting that need.) Now if you are really interested in the question of "where is your God in these hardships?" I can give you my answer. If you meant to ask it rhetorically simply to say, "We live in a messed up world that needs help" I will agree with you, and I the God I believe in would agree with you too. If you care to have an actual debate, I'm game. If you just like to ask "hard" questions but don't care to hear the answers, then I wish you all the luck in you ventures through ignorance. What makes you think it’s my computer? Obviously you don’t follow what you are trying to accuse me of, why haven’t you given up your possessions? No they don’t, they have a place to live, food, etc… they are getting something from doing their work.. “The Salvation Army offers a robust benefits package to our regular, full-time employees.The Salvation Army has an Educational Assistance Program available to employees who are seeking to build on their educational foundation. Retirement plans include a Pension Plan for eligible employees, as well as the opportunity to participate in a tax deferred annuity program. Why don't I? Because I don't claim that you have to give up everything to be helpful. You have again diverted the attention from my question of what you mean by everything. Do you know how illogical it is to suggest that someone should sacrifice everything in the name of the impoverished? To do so would make you impoverished! I'm accusing you because you claimed that you really are giving up "everything" yet you have not indicated to me still what that means. and a computer by which to comment perhaps you misread that comment. I did not as.sume you owned a computer, but was indicating that you have the means to access A computer–meaning you are near some source of electricity. "you have again diverted the attention from my question of what you mean by everything." I have 4 pair of clothing, one pair of shoes, a back pack and toiletries and nothing more. I live day by day, I go where I am needed. On occasion, my family pays for me to come home where I get a warm bath and amenities. Unfortunately, it's a hard life one many can't do, which is why christians will never be like their christ. If you have ever tried to do without, been without, known what true hunger feels like then even if you claim to know you don't. World hunger and other issues in the world could be solved quickly if all places had a way to get clean water and everyone had a roof over their head. When you realize that 70% of Americans are supposedly are religious many of whom are christians, then look at the greed in this country it speaks volumes about the morality of that religion. Thank you for finally answering my question. I'm impressed with your dedication and I agree that many Christians will never know the suffering and sacrifice of Christ. If I may edit your statement just slightly, I will say that we are in perfect agreement. "World hunger and other issues in the world could be solved quickly if all places had a way to get clean water and everyone had a roof over their head." "When you realize that 70% of Americans are supposedly are religious many of whom are christians, then look at the greed in this country it speaks volumes about the morality of that religion"
I agree again, except replace "morality of that religion" with "morality of many of the people who follow that religion." The Bible asks that everyone give what they can to help those in need. I'm impressed with your sacrifice, and as I mentioned before, it would be illogical if everybody gave all they had, because in such a case then everybody would have nothing. That being said, it makes me sick to realize that the theoretical cost to end world hunger is equal to the amount that Americans spend on ice cream each year. If America gave up just paid double for ice cream every time they bought it (or any other solvable situation similar), then world hunger could end in a year. Makes me rather sickened to be honest. Believe me when I say, for those who claim to believe, but not willing to give, they will have to answer to God (if you believe what I do, that is 😛 ). You don't need to give everything you have, all you need is to give time helping them silently and humbly rather than spending much of your time presumptously propagating your "goodness with no God required" on this board. "You don't need to give everything you have, all you need is to give time helping them silently and humbly rather than spending much of your time presumptously propagating your "goodness with no God required" on this board." I think it's because the poster wanted to show you that lazy people like you who claim they're christian are pathetic. It worked! @Christine – BTW your very name is derivative of CHRIST! The onion is peeled back and there is a rebellious youth of christian parentage, huh? I suggest you read the New York Times Bestseller: "Radical" by David Platt. It is written by a pastor of a large church in Alabama and it is a necessary and timely rebuke on many of the churches in America today. In the book, he calls every Christian to examine their priorities in life. He calls Christians to examine their devotion to Christ and to understand that most are living for themselves instead of others. This self-centered, self-exalting, its all about me and my family Christianity is NOT the Christianity that Jesus and His disciples taught. And this is the point that David Platt makes in his book. Jesus spent the last three years of His life with the outcasts of society, those who were poor, abused, neglected, and without hope. He at the same time, severely rebuked the self-righteous religious people for abusing their power so that they themselves might live comfortably. I believe that God does care for the hungry of this world. We see this in the ministry of Christ and His followers. Christians must be the ones who feed the hungry, clothe the naked, shelter the homeless, and help the hopeless. TRUE followers of Christ do these very things. Therefore, Christine, do not judge Christianity by looking at those people who imperfectly represent its message , but rather, judge Christianity by Who it points to, that is Christ. It is easy to forget the countless millions who HAVE BEEN and are being fed in the name of Christ all over the world. It is easy to forget the countless millions who have been clothed, sheltered, healed, comforted, loved, and encouraged by Christians who are Christians indeed. OH plz Jeremy you are only making excuses for your God through Christ, how pitiful is that. Oh I am an almighty God but it’s not my problem it’s mankind, especially after he inspired that procreation as an important part for humans. Based on what the bible tells Christians to do, it’s really is your God’s fault. We all know you won’t see it that way, you’ll just keep making pathetic excuses for a God you claim is the all mighty, all knowing…oops between your writing and mine….over a thousand people just passed away from starvation, now based on your poor logic….that’s your fault. I see where the difference of opinions lie. It appears that both you and Awkward derive your impression of God–in part, and this is only my impression so I'm not claiming it as fact–from what you've observed from the world. That is, that it's a messed up place and that God doesn't seem to care. I would include SeanNJ in this group as well, except that he has not indicated why he perceives God as someone not worthy of worship. In short, I will not disagree with you. Christians, in general, I believe wouldn't either. The question of a loving or caring God in a world so fallen eats at everybody's mind. May I insert my own beliefs on the matter? The Bible says that God weeps for the tragedies of the world, and that the state of mankind is due to our decision to turn from God–it's for this reason the "Babble" Thumpers believe we should live in some sort of Theocratic nation (I disagree, but that's a point of contention all its own). I can't give you a clear answer on it, because I, like most other people, accept that we don't have all the answers about God, or the universe-sans-God. I will say that I believe that God aims to restore the world to a place without pain (it's the positive side of Revelation, often the book that gets the most dreaded looks from outsiders), and give mankind a world where suffering and evil is no longer existent. Anyway, it's a long-winded debate and we can discuss more if you like, but I'd like to address the second half of your reply more. NOW, and I don't mean this to be disrespectful to your beliefs, it's just a statement of mine; if the god that reveals themselves is the god of the Bible, and in their revelation they say everything in the book is true, I would have active contempt. To create an entire universe, so that He could populate a small planet, and then demand those tiny specs he made spend their time worshiping Him and saying thank you for acts that their limited comprehension could never fully understand is tyrannical (to me). I would have a huge problem with that "God". First of all, the claim that mankind is the only sentient being in the universe is not supported Biblically one bit, though I will say that my impression of the complexity of evolution and probability of life forming on planets even somewhat similar to earth seems fairly miniscule. That being said, my lack of belief in aliens doesn't mean God didn't make them, or that they don't exist, etc. Indeed, the way you describe God does seem quite tyrannical, and if I viewed Him in such a way I would have to say He wouldn't be much fun. When Christians imply that God compels them to worship Him, I think many times nonbelievers interpret that as, "God wants me to do it, so I do it, because He says so." In reality (in my experience), the worship does not stem from a demand to meet a quota, but from an urge to express deep grati.tude. Christians believe that God made mankind, not so it would worship Him, but so that God could have something to love. If I may make few comparisons it might help explain. I'm not sure if you have kids BRC, I certainly don't (too young and all that), or if you have the desire to have kids. But at least for me, and many others that I meet, one of the huge driving factors for having a child is to give another human being your world. That is, I deeply desire to care for, teach, grow with, and interact with a being that I have created or taken in (in the case of adoption). The origin of this desire is inconsequential, but the nature of it reflects exactly what Christians believe God's desire is for mankind. Another good example of this is when you've truly fallen in love with someone. Perhaps you've had a moment in life, as I have, where you have cared for someone so deeply that you can't help but say "thanks" or "you mean the world to me" or whatever is on your heart. That is, in it's more literal definition, worship (or giving of worth). It is this same conviction I have when I worship God, and it is the worship He desires. In fact, that is the reason Jesus called the other portion of the Trinity his Father (God really is genderless, and despite angry disputers, God did not call Himself the Father to support patriarchy or as_sert his maleness, but simply to demonstrate the love He has for His children. Out of the recognition of this symbolism, Christians refer to God as He, and Father–God is just as much "woman" as He is "man"). To extend the analogy a little further–keeping in mind it's not a directly parallel analogy, but meant for illustrative purposes–if you have children, or if you have ever fallen in love with someone, have they ever wronged you without cause? I can say from personal experience that I have been hurt in the love department before, and it really is a shattering experience. If we extend what the Bible says about God, the pain He feels when someone "turns away" or rejects Him is worse, because it claims that He loves us the most. It is for this reason that God cannot be in the presence of sin. Now this begins to get quite theological and nuanced, and from what I gather you appear to form your opinions of God from the way the world works more so than the Bible. This is not a wrong thing, but I must say it can be a bit misguided at times. The first reason for this, at least in my opinion, is that nobody can see the whole world at once. We simply cannot keep track of all the good vs. bad things happening at any given moment. If we choose to focus on the bad, we can say, "God wasn't working" or whatever else, if we focus on the good we can say, "God did that" (as_suming we are thinking about God in context of the situation). But in either case our impression of the world is formed by what we care to focus on and who we care to blame. The Bible never claims that the world is a happy place all the time, and it is for this reason that I consult it as more of an authority on God than the way the world works. Just my beliefs anyway. woops. Please go ahead and "report abuse." It seems in my editing I missed the reply button. If you read back through comments made by Christians you would see that, they are saying you have to do it because the bible says so, it’s the bible telling you what God wants you to do so you do it. The bible after all if you ask a true Christians is the rule book on how God expects you to love him and if you don’t follow it to the letter then you are going to hell. Supposedly your God is all knowing and is completely aware of all the “bad” things happening in this world, to people and yet does nothing. It’s far easier to love someone when you only focus on the good, it’s why so many women stay in abusive relationships. The reality is the God you describe has been documented by the Bible as doing horrific things to humanity. It’s not an all-loving God like you are trying portray. You’re just the abuse woman who is blinded by their delusion, their need to feel love that you over look what a horrific reality of your abuser. A very reasonable response, and I understand it, but I have a different interpretation. As I've said, I see nothing wrong with your faith, the values and "God" you seem to espouse are perfectly fine, and will probably enrich your life. At the same time, I don't get the impression that you would try to condemn someone else's beliefs, or that you believe people should be eternally punished just for not saying thank you to Jesus. Your views seem to be more in line with "live a good life, and if you feel the love of God embrace it". I do not feel the love of a god, not even a twinge, but I understand and agree with your message. But, you have to admit, you are either in the minority, or in a very silent majority, and some of your views (even some in just these responses), do not necessarily run lock-step with the hard and fast rules of most Christian religions. I think your way is much better, and I think it would be best for everyone if faith was governed by those personal directions, and less by one central governing religious body. As for the rest, I do have a child, a brand new one (unfortunately the new baby smell is not as appealing as the new car smell). And I do love him, but I feel that if I was the kind of father to him that I see the "God" from the OT being to his "chosen" people; I would make sure someone took him away from me. If there is a god, I believe that god would have to be far better than any of our human religions give them credit for being, or than any person could ever understand. Contemporary Christianity is not teaching about sin and repentance. There is a war going on humans can not see. What is refered to as aliens are actual demons! What is unforlding in the world are prophecies straight out of the word of the one True Living Father God. Only One way to Him. That is by Accepting His Son Jesus Christ as your personal Savior. There is Power in His shed blood!!! Another "end days" idiot. Someone should build a theme park where people with this unquenchable thirst to experience the apocalypse can put on some 3D glasses and get it out of their system. You know what, I bet if you met me, you just might like me. Do more than that, Get on Board and Spread The Word. This is what is happening. Believe it or not, and believe me The News people don't seem to know, because they don't seem to know What and Why it is going on. JESUS IS REAL. Each one of us will meet Him Face to Face one day. You will be accountable for your words and actions to Him. Hope you get ready now. Repent and Get Saved. Today is The Day of Salvation. You are not Promised tomorrow. You do not want to Mock Jesus. I repeat you do not want to mock Jesus. Being Bold for my Redeemer and Savior. I Thank Him and I Love Him. Sincerely, His Sunflower Angela. What if I don't mock Jesus, if I think he was probably a good guy with good things to say that more people should have listened to, but if I don't believe in his divinity. What if I lead a good life (which I do), am charitable and helpful to those around me, even if I don't know them, and loving and protective of my family and friends; but I do not recognize "His" church? Should I be worried? BRC, that's a good, honest question. First, if Jesus is not the Son of God, then he was not a good person. He was either totally insane or a liar and deceiver. For you see, BRC, he claimed many times and in many ways to be God. Now you and I both know that if someone claims to be God today, our first thought is that they belong in the loony bin, and our second thought is that they are a deceiver/liar that is starting another cult. It cannot be that Jesus was a good person if he is not God! The only options are: Liar, Insane, or the Son of God who died for the sins of the world, was raised from the dead (like He said He would), and coming back again to judge the living and the dead. And each one of us is free to choose to believe and surrender our lives to Him, or to reject Him. Sorry, but liar or lunatic are not the only options. Perhaps these claims and quotes attributed to Jesus were the embellished hearsay of a group of 1st century evangelists who were promoting their new religious cult. If Jesus was an omniscient and omnipotent god, he left very poor evidence of this... ambiguous writings, which have been mistranslated, mistranscribed, misunderstood and misinterpreted. I go with Magic on this one. It is also a very real (I would even say least unlikely) possibility, that he was simply a good man, whose followers became a bit overzealous after his death, adn who was agrandized by people who really really wanted his message to be heard. If that is the case, You can recognize he was a good man, live a good life, and have nothing to fear, wether you attest to his divinity or not. The point that I was trying to get us to, was that if that is NOT acceptable to "God" (or Jesus), then I question and reject their system, because trying to live a good life is all that should be expected of anyone. The problem with the claim that Jesus's words were embellished is that, historically speaking, it doesn't add up. First of all, Josephus (though some question his total credibility) noted that Jesus's followers truly believed He was the Christ. In fact, the youngest projected dates of the scriptures of the NT are within 3 decades of the actual events–plenty of opportunity for surviving eye-witnesses to call the account's shenanigans and prevent the rapid growth of the church that occurred. Considering that all of his disciples died in the name of Christ, it doesn't make sense that they would follow an idea that they knew was embellished or exaggerated. You should be worried. You must accept jesus Christ as your personal savior. He is the only way to the True Father God..
You have to make that decision for you through. No one can make you. “John Hick, a noted British philosopher of religion, estimates that 95 percent of the people of the world owe their religious affiliation to an accident of birth. The faith of the vast majority of believers depends upon where they were born and when. Those born in Saudi Arabia will almost certainly be Moslems, and those born and raised in India will for the most part be Hindus. Nevertheless, the religion of millions of people can sometimes change abruptly in the face of major political and social upheavals. In the middle of the sixth century ce, virtually all the people of the Near East and Northern Africa, including Turkey, Syria, Iraq, and Egypt were Christian. By the end of the following century, the people in these lands were largely Moslem, as a result of the militant spread of Islam. It is very disturbing that religious narrow- mindedness, intolerance, violence and hatred continues unabated due to radomness of birth. Maybe just maybe if this fact would be published on the first page of every newspaper every day, that we would finally realize the significant stupidity of all religions. Psalms 53 To the choirmaster: according to Mahalath. A Maskil of David. 1 The fool says in his heart, "There is no God." They are corrupt, doing abominable iniquity; there is none who does good. 6 Oh, that salvation for Israel would come out of Zion! When God restores the fortunes of his people, let Jacob rejoice, let Israel be glad. A book written by a bunch of bronze age goat hearders and roman politicians has no weight with people who can think for themselves. Try again looser. It really is amazing that those that have nasty things to say about Father God and Jesus are the same ones that will be begging for his mercy! !